DigitalHealth.London Accelerator is a year-long programme supporting 30 small and medium sized digital health businesses. Participants will benefit from a programme that interweaves a bespoke programme of support tailored to your individual company needs, with series of ‘whole-cohort’ supporting events focused on providing the knowledge and connections necessary to build your links with NHS and wider healthcare sector. Each SME will be assigned a Digital Health (NHS) Navigator, an experienced professional from the NHS with the expertise needed to understand your needs and support engagement with the NHS. 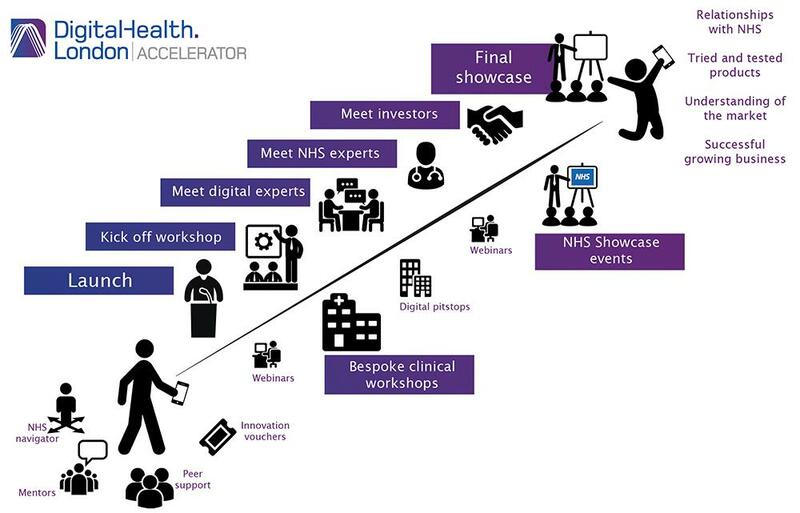 The Navigators will work with the SME to engage with clinicians and healthcare experts, through the Innovation Voucher scheme, as well as to help understand the needs of the market and provide first-hand advice on products in development. Throughout the programme, participants will be provided with opportunities to take part in a range of events, including large ‘Pitstops’ (multi stakeholder sessions over two days), more intimate ‘meet the expert’ sessions on topics such as procurement, IG and interoperability, and ‘Data Clinics’ focusing on developing understanding of key challenges facing data use. Events later in the year will focus on showcasing of products and pitching, taking advantage of bespoke workshops, meetings with health economists and investors. As the programme will sit within the newly established DigitalHealth.London ecosystem, it is uniquely positioned to take advantage of the best knowledge from across our partners; addressing healthcare needs, saving money and improving patient care.